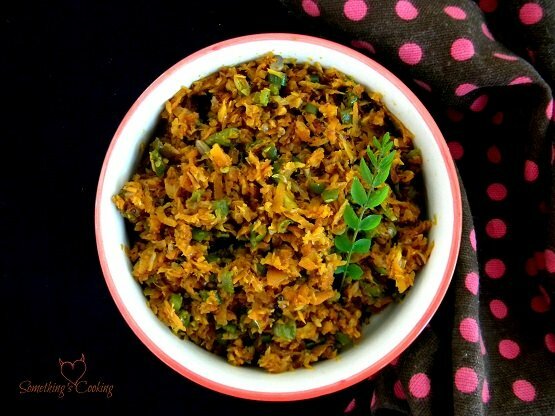 Thoran is a typical Kerala cuisine dish where shredded or finely chopped vegetables are stir fried with grated coconut. Here, I have prepared with a mix of vegetables mainly cabbage, carrot and beans. Mixed Vegetable Thoran or any thoran is an important part of the Kerala Sadya which we serve during Hindu weddings and festivals like Onam and Vishu. 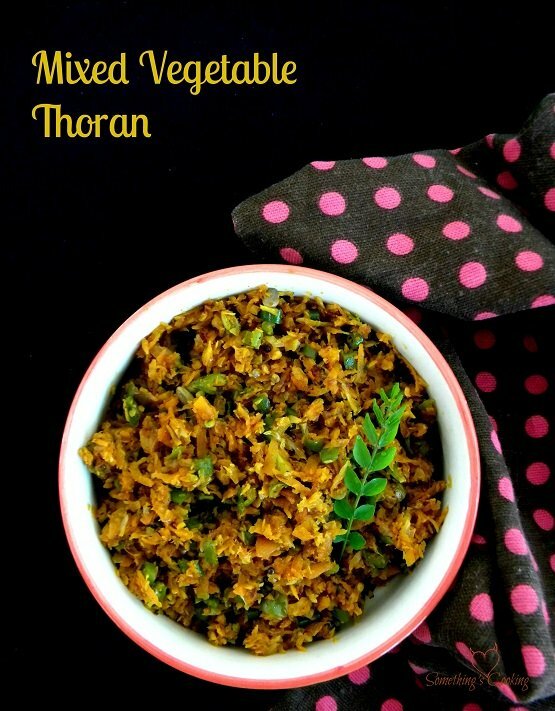 Thoran is a highly nutritious and delicious dish. Some common thoran dishes are Beans thoran, Cabbage thoran and Carrot thoran. But my favorite has always been Amarathus thoran. The bright pink color of the dish would make you fall in love with it instantly. You can bring in variety by preparing Beetroot thoran or Mushroom thoran as well. We also make thoran with Eggs, Anchovies and Chicken too. It can be served as a side-dish to rice and rotis. Mixed vegetable thoran can be prepared with a variety of vegetables. I have made it with cabbage, carrot and string beans. You can also use french beans instead. Feel free to add peas, cauliflower, bitter gourd and/or snake gourd. All you need to remember is to chop them finely or better grate them. This is definitely one of those simple, healthy and gluten-free dish. A must in Kerala Sadya, we also feel our meal isn’t complete without a thoran as a side-dish. 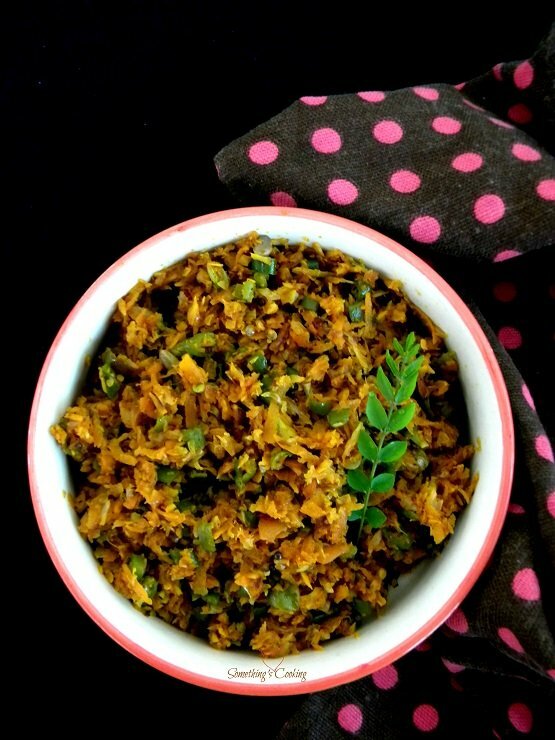 Thoran is a typical Kerala cuisine dish where shredded or finely chopped vegetables are stir fried with grated coconut. Heat oil and add mustard seeds. When it crackles, add cumin seeds. Saute. Add green chillies, garlic, curry leaves, asafeotida and saute for a minute. Add crushed shallots and saute again. Add grated coconut and red chilli flakes. Cook for a couple of minutes. Add the vegetables, turmeric powder, chilli powder, salt and mix well. Close and cook till the vegetables are done. Note that the vegetables should not be overcooked. Since beans takes a little more time to cook when compared to other vegetables, I always cook them in little water prior to adding to this mix. Wow. I am going to try this! It looks fabulous. I am already drooling while reading about it! 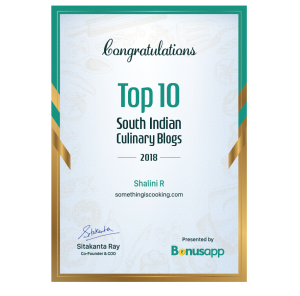 I’m so hungry, your blog= makes me hungry! Thoran is my favorite too, I like the coconut oil flovour that I get when I prepare thoran. I am going to try this again this time with all the veggies you have suggested.